How easily we can forget that each person’s world is unique and even in the closest of relationships there will be differences in perspective, taste, reactions and desires. This is especially so within the world of home. Parents, partners and children can forget that other members of the family live in their individual and unique worlds of likes, dislikes, emotions, beliefs, feelings, inclinations, relationships and experiences. It is easy to assume that the way we see the world is the way others see it, and we can be surprised when we discover they don’t! The word ‘world’ can be used to describe a distinct part or aspect of someone’s experience of life. Most of us are a part of, and move between, different worlds in order to meet our various needs. A single world is unlikely to be the entirety of someone’s life, but a significant and differing aspect of their life. Examples include the worlds of home, work, school, extended family, friends, sports and other recreational activities. While it may seem obvious that each of us is a ‘world unto ourselves’ and we each ‘live in our own world’, worlds may (and often do) overlap. For example, the world of school overlaps with the world of home with regard to homework, morning preparations for school and school friends visiting at home. Individual worlds exist within worlds and are influenced by the worlds they touch. The worlds of home, work and school exist within the worlds of the neighbourhood, larger community, country, continent and planet on which we live. spiritual—how we determine values, higher purpose and meaning. Just as each of us lives and moves between different worlds, so we also see and interpret things differently. 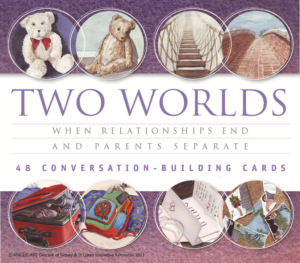 There is no description of the meaning of each Two Worlds card and why there are no words on the cards themselves. Each card has the potential to mean something different to each person. The images on the cards will elicit different associations, meanings, stories and feelings according to such factors as the history, imagination, personality, hopes, dreams, fears and present circumstances of the observer. One person may have different reactions to the same card on different occasions. Equally, two people may have similar interpretations of an image. That is the power and beauty of images—they are open to unique and sometimes surprising interpretations that can give rise to significant conversations and helpful insights. For these reasons, whether working with a group or an individual, it is important to invite each person to speak about what they see in the card (or cards) before them. Because there are no words on the cards, Two Worlds can be used by anyone regardless of their capacity to read English … or any language for that matter! Two Worlds can therefore be used with people who have limited capacity with language. Equally, Two Worlds can assist users who are confident in language and literacy but want to express something beyond words. Some people will look at the cards and see many uniquely Australian scenes, while others will see images that are symbolic of experiences that anyone anywhere can relate to. This is because transitions, changes and separation are a common part of the human experience. While the creators of Two Worlds have chosen cards to reflect the experiences of people living in Australia—regardless of cultural and language backgrounds—we hope that the cards will have relevance for people living in a wide variety of countries and cultural environments.